The Latex 360, which uses the third generation latex inks. 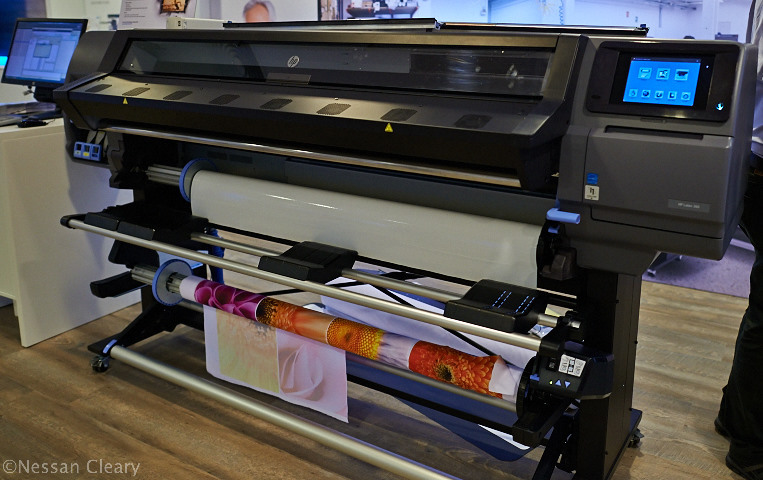 HP is making a determined effort to capture the lower end of the wide format market, with the launch of a new Latex 300 series aimed at low volume users. There are three models, with the top of the range 360 replacing the existing 260 machine, while the 310 and 330 are targeted at more entry-level customers. All of these should be available by 5th May. 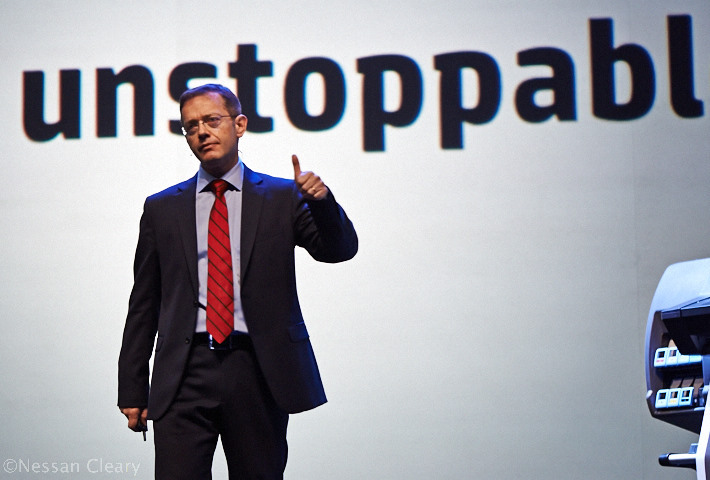 A few weeks ago I sat through a morning of presentations from various HP execs, who really gave it the hard sell. The basic sales messages were repeated over and over again – I felt a little guilty that I had no intention of buying one at the end of it all! It’s obvious that the major competition comes from eco solvent machines. HP does not see Mimaki’s latex efforts as a serious threat, but part of the reason for this is that Mimaki has found that its customers prefer to buy eco solvent printers because they are cheaper to run. Epson also has latex technology in its label printers and could develop a wide format range of printers. I’d say from the conversations that I’ve had with various people at Epson that the company has dithered about this but for now the prevailing feeling seems to be that the low energy usage of solvent printers is better for the environment than the water-based latex inks. But Epson’s marketing has clearly not been as effective at getting this message out as HP’s marketing team, which is quite formidable and backed up by $200m of R&D. Xavier Garcia, VP and GM sign and display business manager. These machines use the third generation latex inks that were first introduced last year with the Latex 3000 mid range printer. These are six colour machines – CMYKcm – but with a seventh channel for an optimiser, which is essentially a primer that helps attract the ink to the right spot for greater dot placement accuracy, and hence better image quality, at higher speeds. The inks also contain an anti-scratch additive that forms a film over the prints, which HP claims gives similar scratch resistance to a hard solvent print. This only works with media that have a smooth surface, such as vinyl, but not textiles. 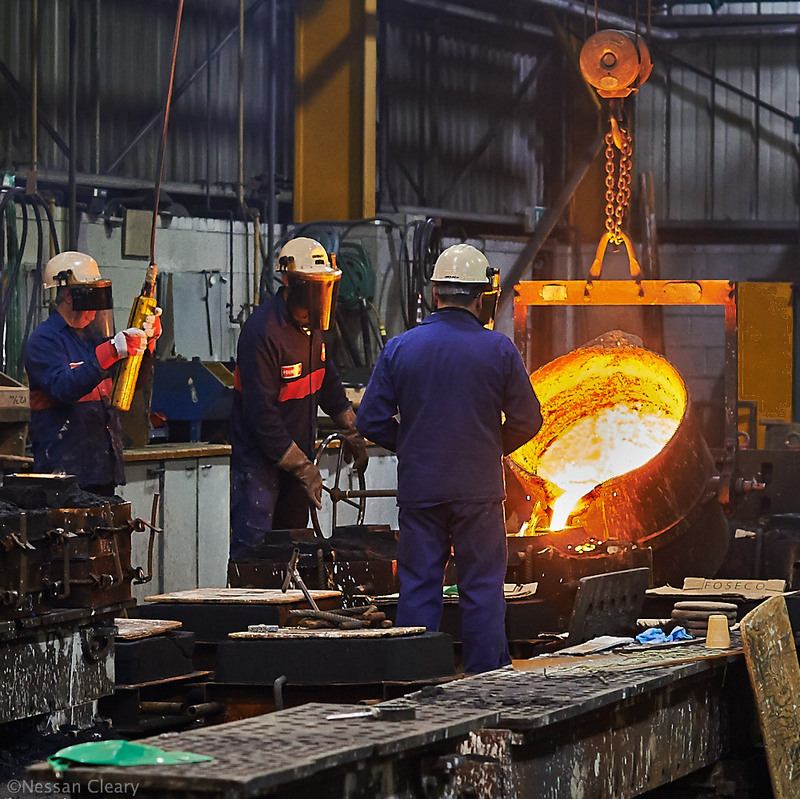 A key factor of the third generation machines is that they cure at a lower temperature than previous models, which means they will work with some of the more heat-sensitive media. This should also lower the energy consumption of the printers. Much of the reason for the lower temperature is down to improved airflow, with hot air being recycled so that there’s no need to heat the dryers up. But HP has also improved the heating elements, so that the machine now reaches its curing temperature within less than two minutes, considerably better than having to wait around five minutes or so to use the printer. However, temperature can also affect the colour fidelity, though Ester Sala, product manager, says that HP is aiming to be within 2 DeltaE. 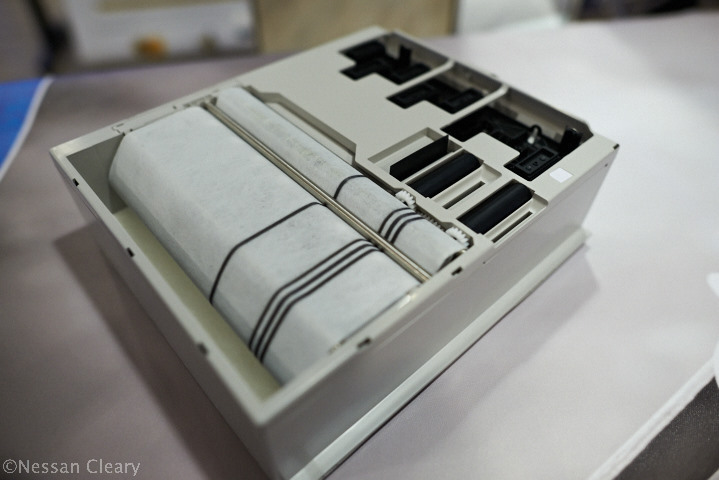 They use an improved version of HP’s thermal print head, which delivers 1200 x 1200 dpi resolution. 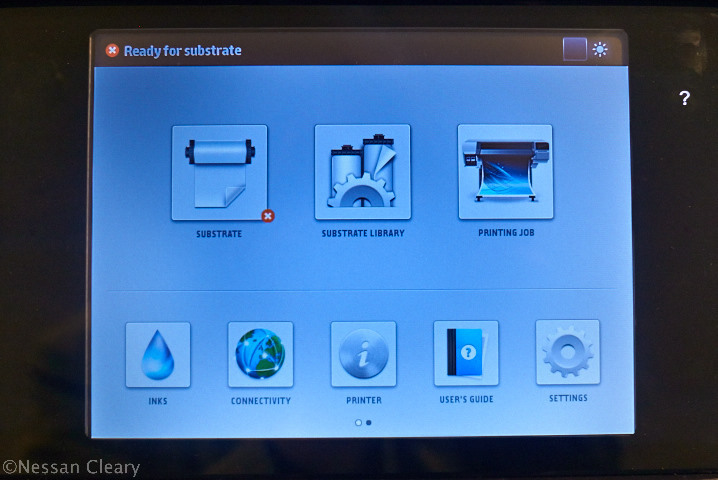 All three printers can be connected to a cloud server that let’s operators download manuals or profiles. They come with a number of generic HP profiles, but through the cloud uses can download further profiles from other media vendors. HP also claims that it’s made it easier to tweak the profiles – latex profiles tend to be more complex than for other inkjet types because of the interaction between the amount of ink that’s laid down, and the amount of heat used to cure it, plus these devices also have to take into account the optimiser. There’s a new maintenance cartridge for collecting any waste,which should simplify the maintenance process slightly. HP claims that these are contone printers, which they obviously aren’t since they are putting dots of ink on a sheet rather than a continuous image. I think that what they are trying to claim is that most of the hard work of actually RIP’ing an image is being done by an embedded controller so that the actual RIP isn’t having to work too hard, but which would seem to mean that the operator has a lot less fine control over the RIP. The 310 is a 1371mm machine that prints from 5-48 sqm/hr, though a normal production speed is probably around 10 sqm/hr. It’s a fairly basic machine, where even the take up reel is an optional extra. All these printers require two power points, for printing and curing, but the 310 is the only one with standard domestic plugs. It costs €13,500. The 330 is a larger version, taking rolls up to 1625mm wide and comes with a take-up reel. It runs from 5-50 sqm/hr, with 10 sqm/hr as a high quality production speed. This weighs in at €17,500. Both of these come with SAi FlexiPrint RIP as standard so that there’s no additional costs. They both have a built-in colour sensor (though not a spectrophotometer) for creating profiles. They have a four-ins touch screen displays that shows the operator the job details and the status of the printer and instruction manuals and videos. There’s a QR code that let’s users pull up that full manual on their smart phone for reference. The 360 is also 1671mm wide but prints at speeds from 5-91 sqm/hr, with 14 sqm/hr as a likely average production speed. This is because the carriage is physically faster, but also because it has more power for curing. It includes a built in i1 spectrophotometer. It also has a much larger eight-inch touchscreen display than the other models. The 360 comes with an ink collector, which can easily be used to replace the ink platen, and makes for better image quality when printing to porous materials, including some textiles, obviating the need for a dedicated dye sub printer. This will cost €22,500, or around £18,500, which seems like quite a jump over the current £10,000 price of the Latex 260 that it replaces. Latex 360, eight-inch dispplay panel. There are also five new latex media, which will be available through Brand Management Group. These include a PVC-free durable suede wall paper, an improved version of HP’s HDPE Reinforced banner plus three photographic media. HP has also extended its WallArt app, which was only available in Apple’s App Store, to Android devices as well. There are some new features including the ability to design wall decals. Garcia says that there have been 1300 downloads, with 80 percent of customers coming back and using it again, making it one of the most successful apps available. At the same event, HP also announced two new 60ins models in its Z range of aqueous ink printers. The Z6600 and Z6800 both print at the same speed, which HP says is double that of the existing 6200 at 140 sqm/hr. But the Z6600 has six colours for reduced ink costs and is mainly aimed at bureaux, while the eight-colour 6800 is capable of better image quality, thanks to the addition of chromatic red and light magenta. Nigel Williams, segment manager for Designjets, says that the Z6600 should use 12 percent less ink per copy, which is a worthwhile saving. The inks should last for up to 200 years indoors. Both print at 2400 x 1200 dpi resolution. Both have three blacks, which should give good monochrome reproduction. They both a built-in i1 spectrophotometer. The Z6800 will cost €15,900, while the Z6600 is €12,400. HP also announced upgrades for its FB500 and 700 UV printers. There are new spindles and a new interface, plus disk drives to store more jobs. they can also now do multiple layer images, up to nine layers, for applications such as backlits. Finally, it’s worth noting that HP is still selling the older, wider latex machine, the 2.6m wide Latex 280, so it seems a fairly reasonable bet that this will also be updated shortly to the third generation inks.